Speechie Freebies: Speechie Freebies' Edublog Awards 2013 Nomination! Speechie Freebies' Edublog Awards 2013 Nomination! First of all, we want to thank all of you for following and supporting Speechie Freebies! We also want to thank those of you who nominated us for the Edublog Awards 2013! We are honored and excited to have made it to the shortlist! This means a lot to all of our authors! 1. Create a Listly by signing in with the social media account of your choice (Facebook, Twitter, Google+, or LinkedIn). 2. Once you have created a Listly account and are signed in, head to the Edublog Awards' website and click the Best Group Blog list in the drop-down menu (or click here). 3. Click the "up" arrow underneath Speechie Freebies' box to vote for us! You can only vote ONE TIME. You can vote for more than one blog. Voting ends at 11:59 pm EST on Wednesday, December 18th, so vote now while you're thinking about it! 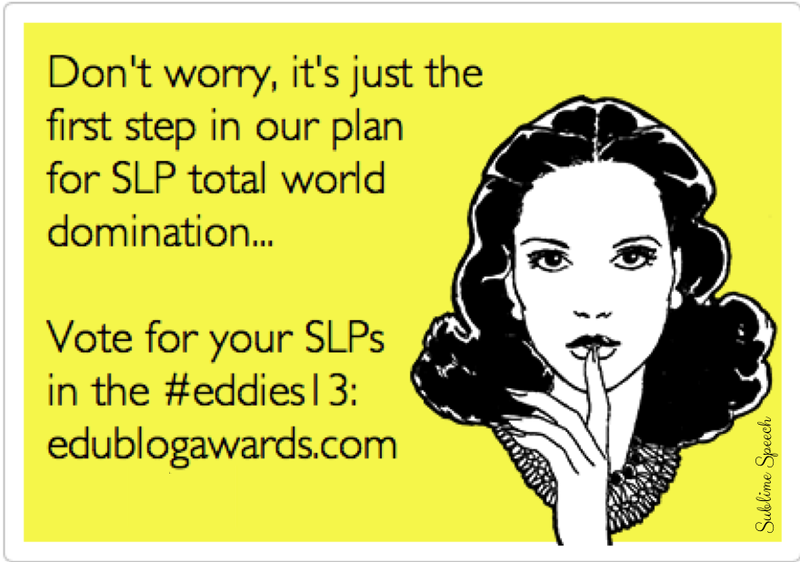 Make sure you check out the other nominated SLP bloggers in other categories! To see a list of those nominated, check out Sublime Speech or Consonantly Speaking's blog posts! Once again, thank you for all of your support this year!